Designed for both men and women to use with a Kegel8 Pelvic Floor Exerciser, our Pack of 4 Perineal Electrodes are specially shaped to contour to your body for very best results. These electrodes are made from high-quality materials, meaning no hot-spots and no nipping, as can be the case with other, lower-quality electrodes. 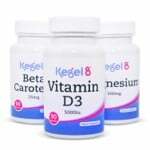 For Men: Kegel8 V For Men features programmes especially designed to be used with electrodes placed on the perineum. By using specially-designed perineal electrodes, you can target the muscles effectively, and the special shape makes exercising both easy and comfortable. For Women: While the Kegel8 Ultra 20 does not feature programmes especially for use with perineal electrodes, these electrodes are perfect for use in conjunction with a physiotherapist. 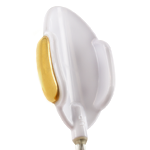 These electrodes attach to your Kegel8 pelvic floor exerciser via your leadwire – simply plug into your machine and follow your Kegel8 User Guide. 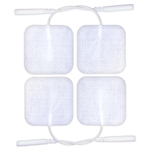 With proper care, as per the instructions enclosed with your electrodes, these electrodes are reusable and can last up to 4 weeks if used daily.